In February, The Greater Bloomington Chamber of Commerce, along with its Health Care Team, hosted the Healthy Business Bloomington Breakfast and Wellness Showcase. This was the third year for the event that helped to launch The Chamber’s Healthy Business Bloomington Designation program which was formulated to support the development and expansion of organizational policies conducive to healthier employee lifestyles. At this year’s event, we were thrilled as we watch more than 125 individuals from varying sized organizations within our community discuss ways to make their businesses more healthy. Worksite wellness programs and prevention are sound ideas whose time has definitely come. Wellness is more fun and costs far less than treating disease. Studies suggest that for every $1 invested in a worksite wellness programs, a company saves $3 to $5 in health and safety costs. Organizations that invest in wellness programs might reap the financial incentives through savings on medical care costs, disability pay, rates of absenteeism, turnover and safety problems. But, what about a small business with 25 or less employees? Businesses of this size may be the most in need of a wellness program. Small businesses are the hardest hit by health insurance costs and often suffer more with frequent absenteeism or lack of productivity. Unlike larger businesses, small businesses owners frequently lack the resources to provide worksite wellness programs that feature such offerings as on-site fitness centers or customized on-line support – but that doesn’t mean that a wellness program can’t be implemented. Many of our local small businesses understand the advantages of providing a wellness program and have created dynamic programs that work well within their business model. To recognize the work and progress of our small businesses, The Chamber’s Health Care Team created a new Small Business Healthy Business Bloomington Designation application especially designed for those businesses with 25 or less employees. The new small business application was introduced at our February Healthy Business Bloomington Breakfast & Wellness Showcase and we’re excited to add more names of businesses to the growing list of those recognized with a Healthy Business Bloomington designation. Every initiative – whether it’s a new diet or a new fitness regime – begins with a pledge to begin. To help businesses take their first steps towards a healthier workplace, The Health Care Team also created a new Worksite Wellness Pledge which includes simple steps a business pledges to implement as part of their worksite wellness program. The simple act of signing this pledge signals the beginning of the wellness process for both the organization and the employees. 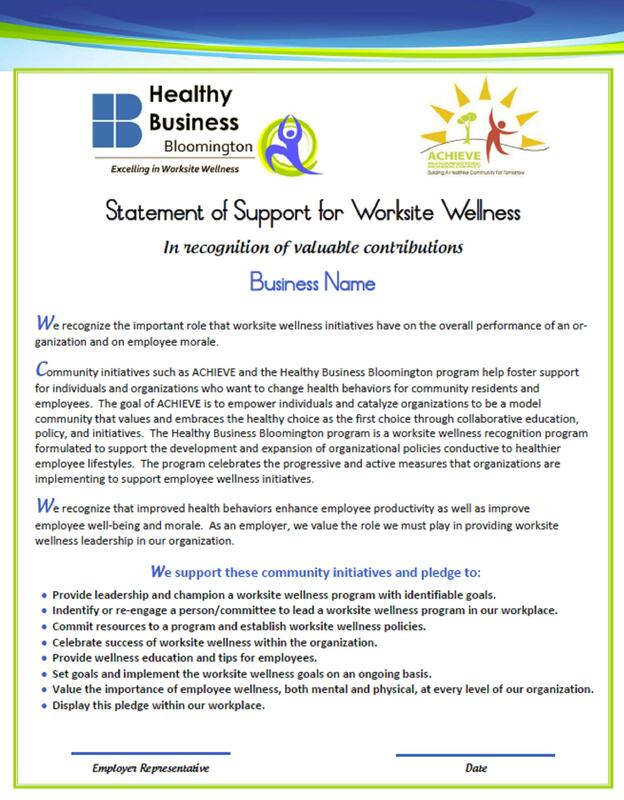 Signing the Worksite Wellness Pledge is a great way to jump start a health and wellness program for your employees. The bottom line is that workplace wellness programs can and do benefit any size business — small or large. Since 82 % of the United States population is linked in some way to a worksite, and because employees spend a minimum of about 200 hours a month at work, the impact of a worksite wellness program can be far-reaching. 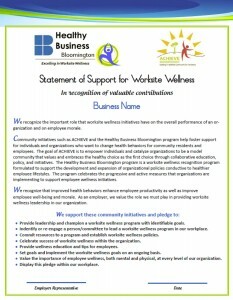 If you already have a worksite wellness program in place – we applaud your efforts and hope you will download a Healthy Business Bloomington Designation application. Please utilize the resources found throughout our community and at The Chamber’s website under our Healthy Business Bloomington section. If you don’t currently have a wellness program, I encourage you to take a closer look at how some simple, healthier changes can make a major difference within your organization. Please download a copy of our new Worksite Wellness Pledge and use that as your first step towards better health. Together, we will build healthier businesses and a healthier community. Please visit: www.ChamberBloomington.org for more information. This entry was posted in Healthy Business, Uncategorized and tagged health, Healthy Business, Healthy Business Bloomington, worksite wellness on May 3, 2012 by Bloomington Chamber Staff.